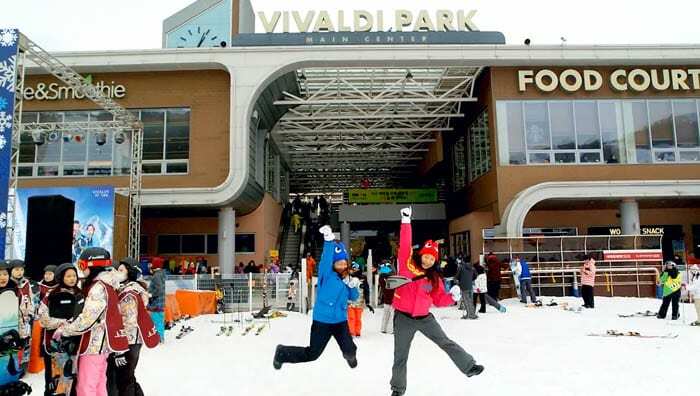 Visit Vivaldi Park to enjoy skiing and snowboarding during the winter in Korea! Hello, Trazers! Greetings from a member of Trazy Crew! Last time, I tried skiing at Phoenix Park for the first time in my life, which was crazy fun. And now, skiing has become one of my favorite outdoor activities. But nowadays, young and hip Koreans are hooked on more “trendy” sports like snowboarding. 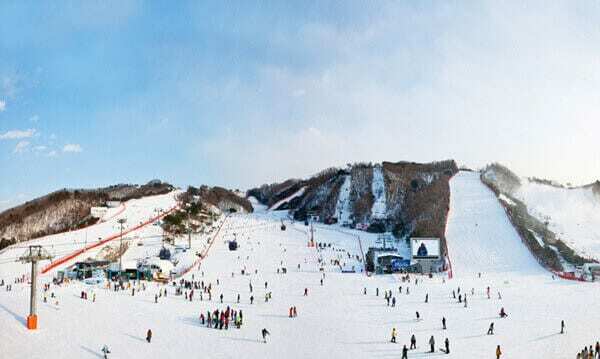 So this time, I headed to Vivaldi Park, or Vivaldi Park Ski World, run by Daemyung Resort. 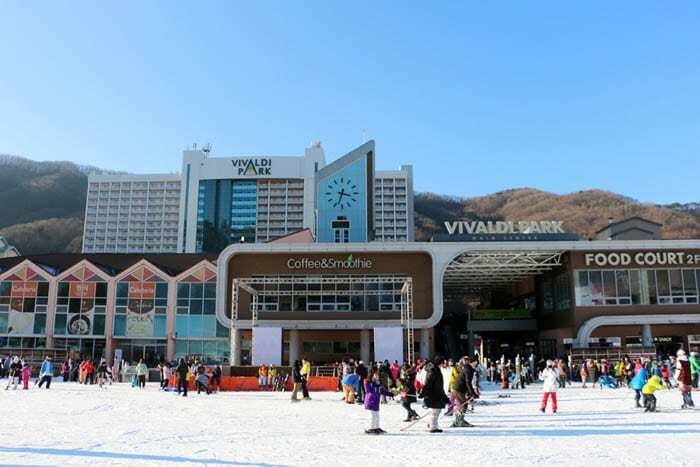 Vivaldi Park, which is known as the most visited ski resort in Korea for 8 consecutive years, constantly upgrades its facilities and amenities to cater to various needs. For its trendy restaurants and stylish buildings, Vivaldi Park claims to be the most fashionable resort in Korea that is beloved by the local younger set in particular. The ski resort boasts the largest lodging facility in the country and offers a wide range of accommodation options – enjoy more than just the slopes. Moreover, the slopes are open from 8:30 am until 5:00 am, making Vivaldi Park a great choice of weekday skiing or night skiing. Make sure you reserve an unforgettable night’s stay in Vivaldi Park right here! Just like the last time when I visited Phoenix Park, I joined a one-day tour because I found it very, very convenient. I’ve done both independent travel and package tours, but I personally prefer tour packages over independent travel as they take all the hassle out of the trip. 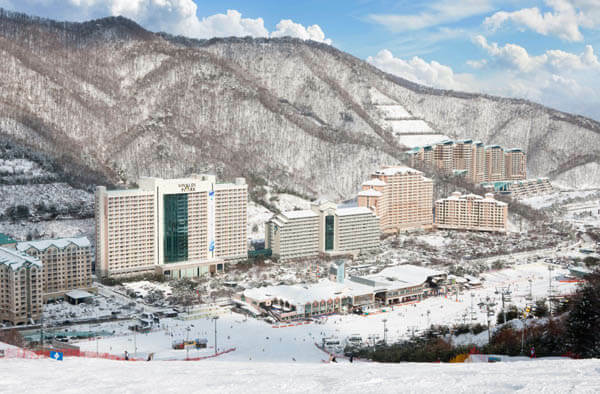 And since there are so many ski resorts in Korea, the tour package can save your time researching and comparing the prices, from ski lift passes to equipment rental and many more things that you need to deal with when planning your ski trip! Seriously, these ski or snowboard tour packages can really save your time and cost. To book one-day tour to Vivaldi Park in Korea, click here. When booking, there are different options for you to enjoy: Ski, Snowboard and Snow Sled for non-skiers. I chose the Snowboard option since I already tried skiing last time at Phoenix Park. Pick whichever you’d like to try this winter – all of them are fun! 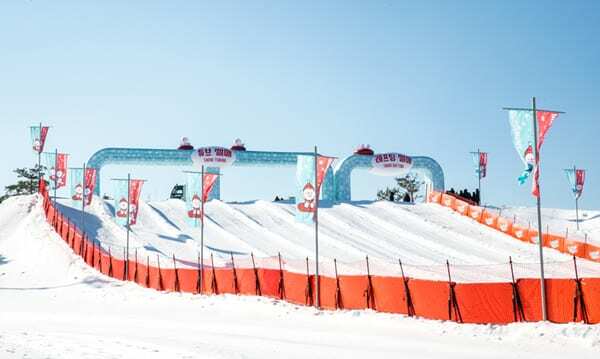 *Helmets and goggles are available for rent on site for an additional 5,000 KRW. For more info, click here. 2. Select an option that suits your need! If you’re a complete beginner, we highly recommend you take a lesson since skiing and snowboarding are a lot more difficult than it looks. There are many options you can choose for Vivaldi Park 1 Day Tour. If you are not sure which options to go for, check out this list and pick the perfect option for you! That’s a lot of options you can choose from. 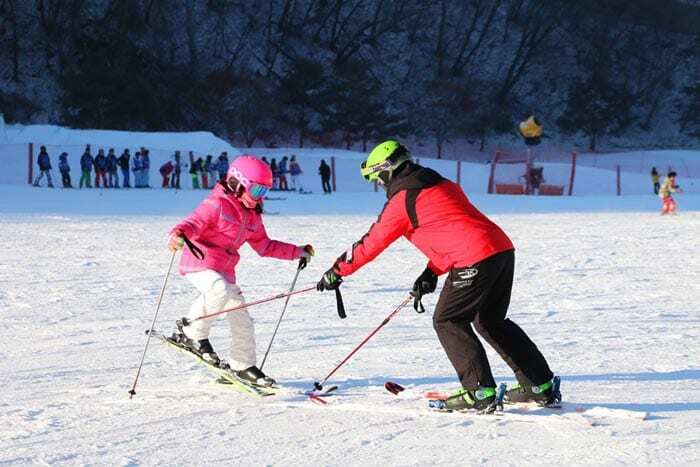 Now you may be wondering, what exactly is the difference between the Beginner Ski Lessons and Intermediate Ski Lessons? We’ve made a clear guideline so that you can determine whether you are a beginner or an intermediate level skier, which is helpful in deciding which options to choose from the 1 Day tour to Vivaldi Park. Hope that clears the confusion with the difference between Beginner Level and Intermediate Level skiing! Hope you can go through these lessons and become an Advanced level skier in no time! Good luck! When I arrived at Vivaldi Park, the ski resort was bustling with people even though I visited on Friday. Due to the ski crowds and long queues, it took a while for me to rent the clothes. The clothing must be returned to the rental shop by 3:30 pm, so when you consider that and the amount of time you have to enjoy the slopes (and possible delays due to long queues and such), it’s a good idea to go on a day other than Friday, Saturday or Sunday. Personally, I advise you to steer clear of the weekends and stick to going on a weekday if you want to avoid the crowd. If you decide to go alone, use the changing room in the ski/snowboard equipment rental area (located across from the building where you rent ski clothes). Personally, I don’t recommend the changing room near the ski clothes rental area at Vivaldi Park inconvenient. There are no separate sections to change the clothes, which means you will have to change with all the female visitors at the resort. But you don’t need to worry if you take the tour package because you will first drop by a rental shop near the ski resort to change into your ski/snowboard clothes and then head to the resort. The changing rooms are not super upscale, but at least you won’t have to rush at this place. 5. Don’t miss out on the eateries! Vivaldi Park is a ski resort where the food’s as good as the slopes, and you don’t want to miss a thing here. 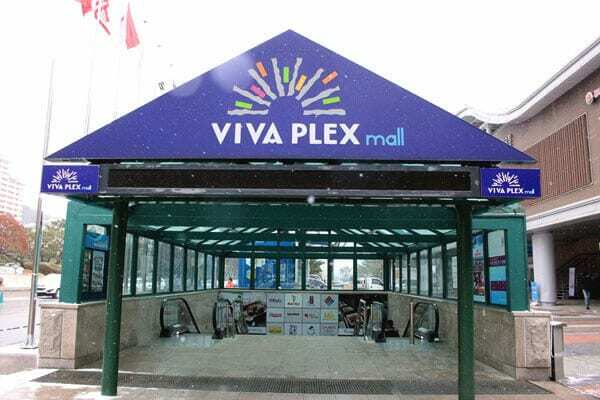 Not only you can find food trucks, a food court, restaurants, cafes and food stalls at the Main Center building, there is also a separate underground complex called Viva Plex (near the entrance of the Main Center) where you can find various dining places that offer more than casual eateries. So even though lunch meal is not provided in the tour packages, there is something for everyone at Vivaldi Park and I personally prefer them without a lunch meal since you will want to try every treat and food offered here. If you’re not that into skiing or snowboarding, I strongly recommend you to use the lift pass and try riding the gondola up to the peak, which offers an amazing panoramic view of the entire resort and the surrounding winter landscapes. The 8-seater gondola takes you up to the peak in about 7 minutes and what more can I say? Try and see them for yourself! We offer you the option to choose the Gondola Package in Vivaldi Park which takes you all the way up to the top of the ski slope to just enjoy sightseeing, for those of you who don’t feel like skiing or snowboarding. Vivaldi Park has 12 slopes in total – 2 for beginners, 5 for intermediate to upper-intermediate, 4 for advanced and 1 for the experts. If you are a beginner, go for the Blues and Ballad courses. The Blues slope is wide and has slight inclines, making it perfect for complete beginners to practice on. In contrast, the Ballad slope has a few steep inclines but they aren’t super intimidating. However, I was too terrified to even attempt snowboarding down it so I just went down the Blues slope twice. But my friend who was also a beginner attempted it though! 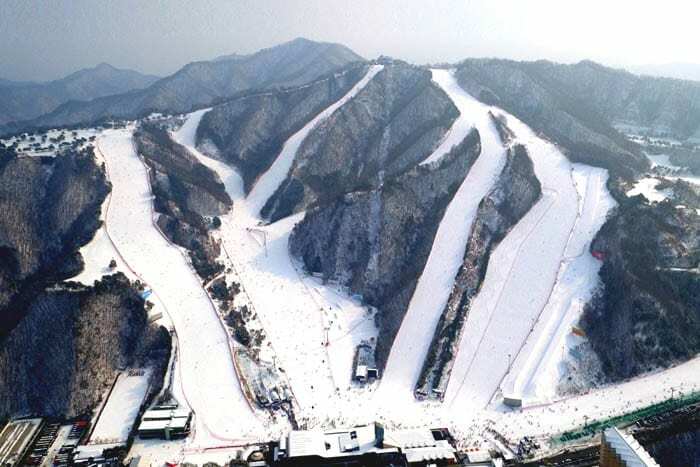 If you are an advanced skier, hit the Rock Course, a 590m-long slope with an incline of 28 degrees. Those who want to practice and elevate their skiing to a higher level, Classic Course can be your best option as the slope is not as steep as other intermediate or advanced slopes. 8. Make sure you check out Snowyland! Recently, the entire snow-sledding area of Vivaldi Park has been remodeled into a theme park which is now called “Snowyland”. Built with 5 unique sledding slopes and numerous thrilling winter attractions and rides. Snowyland is something you DO NOT want to miss when you’re in Vivaldi Park, especially if you are traveling with family. This will be a perfect place to enjoy the snow with kids. When the sun sets, Snowyland becomes a magical place as candlelights illuminate the ‘Snow Light Street’ and turns into a totally different place, making it a great photo spot! Stop wasting time and get your tickets right here! 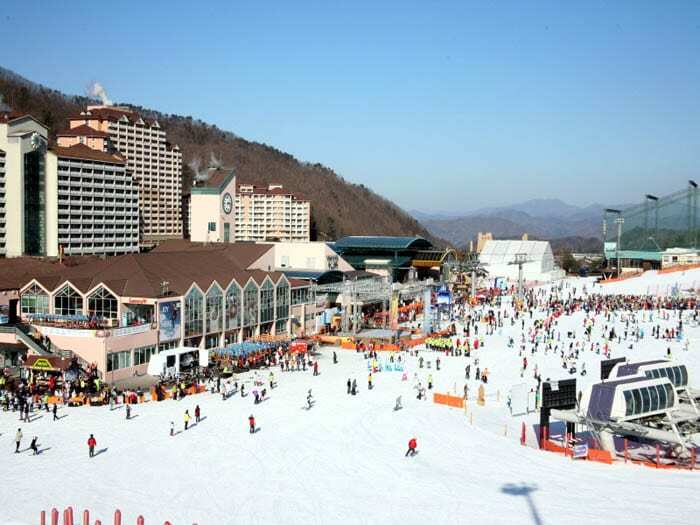 We’ve also got a tour where you can visit Seoraksan Mountain and enjoy the skiing/snowboarding or sledding in Vivaldi Park right here! Last but not least, Vivaldi Park was featured in some of the scenes from the latest Korean drama called “The Legend of the Blue Sea (SBS)“, starring by famous Korean actor and actress, Jun Ji-hyun (Sim Chung) and Lee Min-ho (Heo Joon-jae). In Episode 6, Sim Chung asks Heo Joon-jae to take her somewhere with snow and the two enjoy skiing on the slopes at the resort! 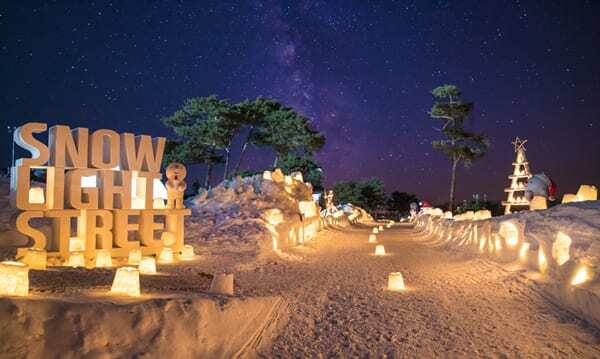 Whether you are K-drama enthusiast or not, the snowy slopes and the beautiful scenery around Vivaldi Park make it the perfect spot to turn up the heat on your romance. Did you get some ideas on how to plan your trip to Vivaldi Park? Then start planning! 👇 Book your ski trip to Vivaldi Park here! 👇 Or book a ski & sightseeing tour to Vivaldi Park + nearby attractions. Finally, watch this video below to see how much crazy fun Trazy Crew had fun at Vivaldi Park! 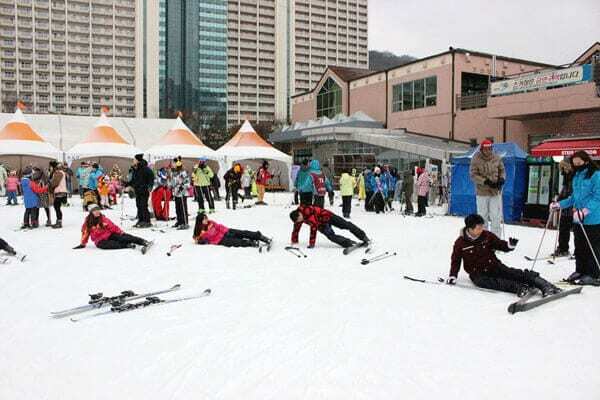 To find more winter tours and ski packages, make sure you visit Trazy.com, Korea’s #1 Travel Shop! great info..we’re planning to go there december 2017..very useful information..thanks a lot! Thanks for sharing this guide. I will be visiting South Korea soon to ski. Hi Joanna Lopez! Unfortunately, the Vivaldi Ski/Snowboard Resort will operate during winter season. (~02/28) Thank you! The Snowy Land at Vivaldi Park is expected to close on Mar 4. If you are planning to visit Korea in late March, we recommend you to check out the spring specials now available to book on Trazy! Hi, we planning to visit in Dec 2018. Are there any package for now? hi, we will be going also at Vivaldi Snowland come December 2018, but only my Daughter will have Ski/Lesson, but we will be going with her at the resort to watch her. shall we only pay the entrance fee?how much? Nice for the great sharing! May I know the rental amount details for ski clothes, boot, gloves? I can do the rent when i reach there ya? hi, is 1 day ski package available for this September? Planning to go there on Sept 20, ’18. 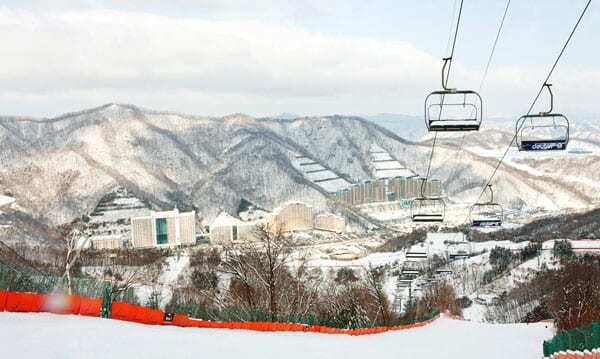 As the winter season in Korea starts in December, most of the ski resorts open in mid-December until February. Considering your visit date, we recommend you to check out the links below for some of the tours that you may be interested in. We are reaching Seoul 29 Nov 2018. Planning to go skiing 2D1N on the 5-6 Dec . Will there be snow already ? Thank you. You can book the Vivaldi ski resort during that period on our website but we cannot guarantee if it will be snowing at the time. Also, since the skiing activity is highly dependant on the weather, the ski resort might open later than expected or the number of the slopes that are operated is subject to be changed. I want to book a night stay for family of 4 persons … with 1-2 hours ski lessons … from 20/12/2018 to 21/12/2018 ??? If you have any further questions, please don’t hesitate to contact us at ‘inquiry@trazy.com’. I will be going to Vivaldi on January 2019 with my husband and my 19 months kid. Both my husband and I want to ski. Can I bring my kid to the ski area ? Hi Deela! In order to enter the skiing area, everyone has to be fully equipped. Also, the minimum age for skiing activity is from 40 months old. If you have a child who’s under this age, we recommend you to visit Snowyland in Vivaldi Park where you can snow sled and do other multiple activities using snow. This park looks very beautiful! Snow drifts make it truly magical. I would love to visit this resort! Hi Jasmin! In Vivaldi Park, there are 2 types of gondola. One you take so you can go to the Snowyland where you can snow sled and the other one that takes you to the top of the ski slope. The latter one allows you to do the sightseeing and see the entire scenery of the ski resorts. If you purchase the Gondola ticket only package, it includes the Gondola ride ticket that goes up to the ski slope for one round trip. Is there any package for 2 nights staying? Any room for a 3-person family? We plan to go December. Thank you!